Our product range includes a wide range of industrial water ozonator, water ozonator and water purifier ozonator. Ozone is the most powerful commercial oxidant in the world. It has been used primarily as disinfectant for drinking water since the early 1900's. Its is also useful for waste water disinfectants and malodorous off gases from waste water treatment plants. Because ozone must be generated on site for immediate use, this is best done through an industrial water ozonator. The advantage of ozone for commercially treating waste water is that it destroys bacteria, inhibits algae growth and reduces scaling in problem areas. It has faster reaction rate than chemicals and only oxidation not chlorination, takes places. The ozone is purged into the final storage tank before the water is packed in the Automatic Filter. 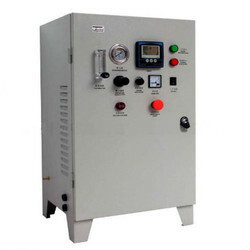 The Ozone generator is one of the type in the world at uses absolutely latest ozone dielectric tricoide tube technical from Canadian Clear The ozone generator uses upon 0.5 HP Compressor, air drier and air oil separator along with the micron air filter which are the pre- requisites of the air before the air is send to the ozone generator. We offer high quality Water Ozonator, working of which are based on ozone gas. This gas is considered as the most powerful oxidant use in various commercial applications. To disinfectant the water, our water ozonators/ozone water purifier are considered as the best option to the customers. These ozonators have extensive demand for various commercial applications. These can easily destroy algae growth, bacteria and also reduce the sealing of the problematic areas. Over other chemical disinfectants, these exhibit faster operation rate and oxidation rate in different commercial applications. Ozone is the most powerful commercial oxidant in the world. It has been used primarily as a disinfectant for drinking water since the early 1900's. It is also useful for waste water disinfection and malodorous off-gases from waste water treatment plants because OZONE must be generated on site for immediate use. This is best done through a ozone generator. The advantage of Ozonators for commercially treating waste water is that it destroys bacteria, inhibits algae growth and reduces scaling in problematic areas. It has a faster reaction rate than chemicals and only oxidation not chlorination takes place. Ozonators provide rapid and efficient oxidation of many industrial contaminants. It is very effective for oxidizing iron and manganese, removing phenols, organic waste constituents and heavy metal contaminants. An additional advantage is that water treated with OZONE does not contain any chlorinated compounds that require further treatment prior to disposal. OZONE is used in the bottling industry for water treatment and sterilization of the bottle-cleaning water. It is also used in beer making and the soft drink bottling industry. Fish hatcheries use OZONE in lieu of other disinfectants, both as a bactericide and a source of dissolved oxygen. In the pharmaceutical industry, the requirement for purity of the reagents makes OZONE ideal for both oxidation and disinfection. Another typical situation of biofouling controls is the treatment of recirculation water in air conditioning cooling-tower systems.